Showing results for tags 'm14'. I have for sale a used Springfield Armory M1A with a Sage EBR chassis in FDE and Sage scope rail. Gun is in excellent condition and has had maybe 250-300 rounds through it. Gun will shoot sub MOA with match ammo. One twenty round magazine is included. I am asking $1950.00 shipped in the lower 48 for the complete package. (scope and rings not for sale) I accept discreet paypal (buyer pays fees) or USPS money orders Buyer is responsible for knowing if rifle and magazine are legal in his/her state. For your consideration, new old stock USGI M14 National Match front sights. All are marked NM 062. They have very minor storage marks on the edges but no rust or damage. Screw included. $32ea shipped to US ALL SOLD Prompt PayPal gift or +fees No trades CROSSPOSTED Thank you for looking!! We offer quite a few X Products 50 Round Drums for the HK 91/G3/PTR, AR-9MM, AR-15 .223/556 & AR-15 308, and M14/M1A .308 rifles. These are some of the best designed drums that are made from steel & aluminum and are easy to load and unload. We offer a few skeletonized drums, so be sure to check out the listings below. Order on our website or by phone. WWW.HKPARTS.NET || 801.987.3494 _____________ [HK 91, G3, PTR Drums] 50 Round Drum For HK 91, G3 & PTR Rifles || $249.95 [PICTURED - TOP RIGHT] https://www.hkparts.net/shop/pc/50-Round-Drum-For-HK-91-G3-PTR-Rifles-9p1283.htm 50 Round Drum HK 91, G3 & PTR - Skeletonized || $299.95 https://www.hkparts.net/shop/pc/50-Round-Drum-HK-91-G3-PTR-Skeletonized-9p16731.htm _______ [AR-15 Drums] X-15 50 Round Drum AR15, M4, MR556 .223/556- Black || $199.95 https://www.hkparts.net/shop/pc/X-15-50-Round-Drum-AR15-M4-MR556-223-556-Black-2p14404.htm X-25 50 Round Drum for AR-15 308 Style Rifles || $269.95 https://www.hkparts.net/shop/pc/X-25-50-Round-Drum-for-AR-15-308-Style-Rifles-2p1996.htm X-15 Skeletonized 50 Round Drum for AR-15 .223/556 - Black || $297.95 https://www.hkparts.net/shop/pc/X-15-Skeletonized-50-Round-Drum-for-AR-15-223-556-Black-2p16554.htm X-25 50 Round Drum Skelontized For AR-15 308 Style Rifles || $349.95 [PICTURED - BOTTOM LEFT] https://www.hkparts.net/shop/pc/X-25-50-Round-Drum-Skelontized-For-AR-15-308-Style-Rifles-2p17764.htm _______ [AR-9MM Drum] X-9 50 Round Drum Magazine For AR - 9MM || $219.95 https://www.hkparts.net/shop/pc/X-9-50-Round-Drum-Magazine-For-AR-9MM-2p17766.htm _______ [M14 Drum] X14 50 Round Drum for M14, M1A .308 Rifles-USED || $249.95 https://www.hkparts.net/shop/pc/X14-50-Round-Drum-for-M14-M1A-308-Rifles-USED-2p17884.htm _____________ Thanks for looking! Click here to visit our website to view more HK parts & accessories. 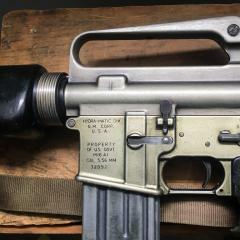 Factory Original Spanish Cetme L 5.56 post sample machine gun, $1,050 shipped. Factory Original Norinco M14 post sample machine gun, $2,020 shipped. Professionally done PPSH41 with one mag, $865 shipped. These are post sample machine guns, if you are not a Class 3 dealer or manufacturer with a "law letter" you cannot purchase them. We offer quite a few X Products 50 Round Drums for the HK 91/G3/PTR, AR-9MM, AR-15 .223/556 & AR-15 308, M14/M1A .308, and FAL rifles. These are some of the best designed drums that are made from steel & aluminum and are easy to load and unload. We offer a few skeletonized drums, so be sure to check out the listings below. Order on our website or by phone. WWW.HKPARTS.NET || 801.987.3494 __________ [HK 91, G3, PTR Drums] 50 Round Drum For HK 91, G3 & PTR Rifles || $249.95 [PICTURED - TOP RIGHT] http://www.hkparts.net/shop/pc/50-Round-Drum-For-HK-91-G3-PTR-Rifles-9p1283.htm 50 Round Drum HK 91, G3 & PTR - Skeletonized || $299.95 http://www.hkparts.net/shop/pc/50-Round-Drum-HK-91-G3-PTR-Skeletonized-9p16731.htm [AR-15 Drums] X-15 50 Round Drum AR15, M4, MR556 .223/556- Black || $199.95 http://www.hkparts.net/shop/pc/X-15-50-Round-Drum-AR15-M4-MR556-223-556-Black-2p14404.htm X-25 50 Round Drum for AR-15 308 Style Rifles || $269.95 http://www.hkparts.net/shop/pc/X-25-50-Round-Drum-for-AR-15-308-Style-Rifles-2p1996.htm X-15 Skeletonized 50 Round Drum for AR-15 .223/556 - Black || $297.95 http://www.hkparts.net/shop/pc/X-15-Skeletonized-50-Round-Drum-for-AR-15-223-556-Black-2p16554.htm X-25 50 Round Drum Skelontized For AR-15 308 Style Rifles || $349.95 [PICTURED - BOTTOM LEFT] http://www.hkparts.net/shop/pc/X-25-50-Round-Drum-Skelontized-For-AR-15-308-Style-Rifles-2p17764.htm [AR-9MM Drum] X-9 50 Round Drum Magazine For AR - 9MM || $219.95 http://www.hkparts.net/shop/pc/X-9-50-Round-Drum-Magazine-For-AR-9MM-2p17766.htm [FAL Drum] FAL 50 Round Drum For 308 Rifles || $269.95 http://www.hkparts.net/shop/pc/FAL-50-Round-Drum-For-308-Rifles-2p2037.htm [M14 Drum] X14 50 Round Drum for M14, M1A .308 Rifles || $269.95 http://www.hkparts.net/shop/pc/X14-50-Round-Drum-for-M14-M1A-308-Rifles-2p2373.htm __________ Thanks for looking! Click here to view our website for more of your HK needs. This gun comes with the box and only has had 40 rounds fired. Looks new, and pretty much is. Stainless steel, with black polymer stock. Weatherproof setup great for humid areas. No damage, no problems. Has the factory 5 round magazines included and stainless scope rings. Factory box included. Can send pics.